A couple of years ago, I went on a dystopian reading bender (snaps to Rhiannon for that craze), and I was most impressed by Patrick Ness’ The Knife of Never Letting Go. It was raw and amazing, and I resolved to keep an eye out for Ness’ books. Last summer I started hearing trickles of praise for his latest release, A Monster Calls. Then Kiersten White wrote about how much she loved and cried over it. I placed it on hold at my local library and that was that. At seven minutes past midnight, thirteen-year-old Conor wakes to find a monster outside his bedroom window. But it isn't the monster Conor's been expecting – he's been expecting the one from his nightmare, the nightmare he's had nearly every night since his mother started her treatments. The monster in his backyard is different. It's ancient. And wild. And it wants something from Conor. Something terrible and dangerous. It wants the truth. 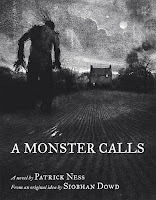 From the final idea of award-winning author Siobhan Dowd – whose premature death from cancer prevented her from writing it herself – Patrick Ness has spun a haunting and darkly funny novel of mischief, loss, and monsters both real and imagined. Patrick Ness has a talent for pulling emotion out of the most reluctant reader. He writes stories that reach the hidden thoughts we all carry with us. It’s unsettling, it’s beautiful, and you end up wrecked and happy and feeling as though you SURVIVED. In A Monster Calls, Ness stays true to form (and delivers a masterpiece). I’ve discovered that I enjoy Ness’ books when I go into them blind. You don’t need to know in advance what the main conflict is in order to enjoy it. So my usual summary is brief: Conor meets a monster, and it shows him true things. True, terrible, unthinkable things – about himself, and stories, and the sometimes unbearable road of life. Of course, the beauty of the hardcover volume (delightful presentation might be my weakness) does not hurt. A Monster Calls is filled with fantastic illustrations by Jim Kay, all done in black and white and focused on texture and shadow. Add in the jacket and endpapers, along with the content, and it may be THE perfect gift book. I’d even put out on a coffee table for people to admire. To recap, A Monster Calls is bitter, sweet, and lovely on the inside and out. It may (probably will) touch your soul. Recommended for: anyone with a heartbeat. It is beyond excellent. My desire to get a hold of this book grows with every review I read on it. Awesome review. Seriously. You won me over with this paragraph: "Patrick Ness has a talent for pulling emotion out of the most reluctant reader. He writes stories that reach the hidden thoughts we all carry with us. It’s unsettling, it’s beautiful, and at the end, you end up wrecked and happy and feeling as though you SURVIVED. In A Monster Calls, Ness stays true to form (and delivers a masterpiece)." I've had an ARC of this one here forever but I always feel emotionally unprepared for what I'm expecting from it. I really just need to take the plunge! I read it as an ARC--but it's so good I'm planning on getting the real thing! Delightful presentation is my weakness too! I love seeing a pretty book. I adored this one. It painted such a raw, but realistic pictre of grief. I have heard excellent things about this book. I'm just waiting for the right moment to read it - for the right mood to strike me. "Unsettling," "beautiful," "wrecked," and "happy" all in the same book. Wow! May just have to give this one a try!